The Incredible Hulk Returns is a 1988 American made-for-television superhero film based on the Marvel Comics character the Hulk which serves as a continuation of the 1978–1982 television series The Incredible Hulk. In The Incredible Hulk Returns, Dr. David Banner, a scientist who transforms into a green-skinned superhuman monster when enraged, believes that he has found a potential cure for his condition, but he is sabotaged by the inexplicable arrival of the arrogant warrior-god Thor, who has been banished from Valhalla. The two then team-up to battle a rising criminal organisation. Bill Bixby returns as Banner and Lou Ferrigno reprises his role of the Hulk. Eric Kramer makes his first and only appearance as Thor and Steve Levitt stars as Donald Blake. This was also Jack Colvin's last appearance as Jack McGee. Dr. David Banner has been gainfully employed at the Joshua-Lambert Research Institute (as David Bannion) where he and a team of scientists are putting the final touches on a Gamma Transponder, which he intends to use to cure him of his ability to turn into the Hulk. He has not changed into the Hulk for two years since he met a young widow, Maggie Shaw, with whom he is romantically involved. By chance, he is recognized by a former student of his, Donald Blake. Blake reveals that, on an expedition in Norway, he was bound into possession of an enchanted hammer containing the soul of Thor, an immortal warrior banished by Odin to Earth. Thor is reluctantly compelled to serve Blake, who is unnerved by this. Thor damages equipment and angers Banner until he turns into the Hulk, who easily fights him off and leaves. In the morning, Banner scolds Blake for setting back his experiment and demands that he and Thor make amends. Journalist Jack McGee hears of sighting of the Hulk and attempts to track him down. Thor laments of his banishment from Valhalla and bonds with Blake at a bar, briefly entertaining the possibility of Thor using his powers to fight crime. A criminal organisation within the Joshua-Lambert Institute seek to kidnap Banner and the Transponder, but the Hulk effortlessly dispatches them. The mob leader LeBeau targets Dr. Shaw instead of Banner. Mob members disguised as police officers ambush Banner and Shaw and kidnap Shaw despite the combined efforts of the Hulk and Thor. LeBeau blackmails Banner into handing over the Transponder in return for Shaw's life. Banner sabotages the Transponder so it cannot be used as a weapon, removing his chance of a cure. Hulk, Blake and Thor ambush the gang's hideout and fight off a legion of gunmen to rescue Shaw. McGee is once again the subject of ridicule for his obsession with the Hulk and Thor. Blake and Banner both agree that Shaw has likely figured out that Banner and the Hulk are one and the same and that Banner should leave to protect her. Thor and Blake, now at peace with each other, say their goodbyes to Banner. Banner is forced to end his relationship with Shaw and once again leaves to find a cure. Unlike the preceding series which was produced by MCA/Universal, this film and the following two sequels were produced by New World Television (New World was Marvel's owner at the time) and Bill Bixby's production outfit, which, in association with NBC, took over the Hulk television franchise from former broadcaster CBS. Bill Bixby recruited Nicholas Corea, who wrote and/or directed many episodes of the Incredible Hulk TV series, to write and direct The Incredible Hulk Returns. Stan Lee was a consultant on the film. Kenneth Johnson, the creator/executive producer (and sometimes writer/director) of the TV series, was not invited to contribute to the film. This television movie acted as a backdoor pilot for an unproduced television series featuring Thor, another Marvel Comics character created by Stan Lee and Jack Kirby based on the Norse mythological deity of the same name. Much like the television treatment of the Hulk, Thor's backstory has been altered from his original comic book appearance: while in the comics Donald Blake and Thor shared the same body and could transform by use of an enchanted cane, Thor is here depicted as being a servant of Blake and they are two separate entities, though he is still depicted as having been banished on Earth by Odin for being an arrogant and irresponsible warrior. His status as the "god of thunder" is ambiguous (though he does once claim to be the "son of Odin"), his powers are heavily limited and his hammer is not restricted by the "worthiness enchantment". This film is the first time another character from the Marvel Universe or any genuinely supernatural or otherworldly elements appeared in the universe of the Incredible Hulk TV series. Thor and the Hulk would next appear on-screen together in 2012's The Avengers, played by Chris Hemsworth and Mark Ruffalo respectively. 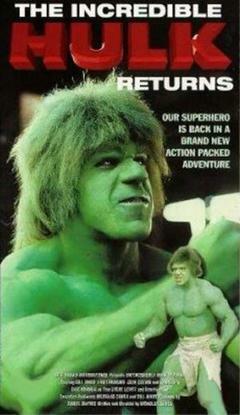 The Incredible Hulk Returns was a major ratings success, outdoing even the high expectations directed to it as a reunion of the Incredible Hulk TV series. This television film was released by Anchor Bay Entertainment on May 13, 2008 along with The Trial of the Incredible Hulk as a DVD double feature. They were re-released by Image Entertainment on October 11, 2011. ^ Harmetz, Aljean (1988-10-11). "Superheroes' Battleground: Prime Time". The New York Times. Retrieved 2010-08-12. ^ "Hulk Smash Television!". IGN. Ziff Davis. Retrieved 2010-09-09. ^ a b Glenn, Greenberg (February 2014). "The Televised Hulk". Back Issue!. TwoMorrows Publishing (70): 25. ^ O'Connor, John J. (1988-05-20). "TV Weekend; Incredible Hulk Meets Mighty Thor". New York Times. Retrieved 2010-08-10.